While it's quite rare to find an action movie with such emotional depth-- it only takes a few moments of witnessing Liam Neeson's pitch-perfect, understated performance to realize that it's his take on the Taken character that has made director Pierre Morel's film one of the most surprising and strongest works so far in 2009. Admittedly, seeing Neeson's extraordinary turn as a man desperately trying to reconnect with his daughter and then find her when she's taken-- since he'd sacrifice anything for a loved one-- makes the film all the more emotionally heartrending on DVD and Blu-ray. For when the movie debuted, Neeson became an overnight thinking man's action hero to theatre goers around the globe but now, his pain throughout the movie is quite searing as it's augmented in the minds of viewers who are still shaken by Neeson's real-life, devastating tragedy in the recent loss of his beautiful, talented wife and mother to his children-- Ms. Natasha Richardson. Of course, it's an important critical aspect to separate the work from an actor's personal life but I admit it's quite hard given the subject matter of Taken yet above all Neeson's humanity and integrity shines through. And in the film, he hits us on a level we didn't quite expect in a work in which I was shocked to discover the actor did a majority of his own stunts but before I analyze the Blu-ray's extras and features, I'll start it off by posting my original theatrical review below for your convenience (so you don't have to jump from screen to screen). True to form for Fox Blu-ray-- the quality of Taken's transfer is superlative. Much like Disney, Fox has managed to perfect the art of Blu-ray in a way that not only presents the absolute best reproduction of the film in the 1080 high definition digital pixels but also somehow manages to ensure that viewers will receive the most satisfying display and sound, regardless of their screen size or speaker set-up. In a refreshing change in a world of some hurried Blu-rays where my volume lunges near 65 to make out the dialogue before explosions and music nearly blast me out of the chair-- the mixes from Fox have been consistently first rate. In fact, when I first made the switch to Blu-ray and was testing out the player simply on my computer, I was less than impressed by the muddied colors and artifacting I witnessed in a competitive studio's new release (which shall go nameless) and-- wanting to make sure the upgrade was worth it-- I went out and rented a plethora of discs and as soon as I checked out Fox's Transporter 2, I knew I'd become a Blu-ray convert. 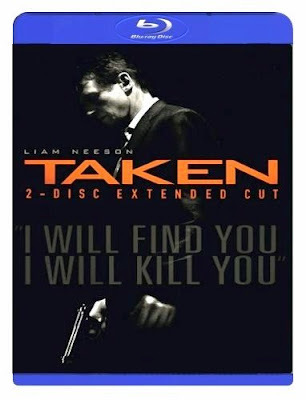 Taken's Blu-ray offers two versions of the film-- the theatrical release and the unrated extended version but being that the extended version only extends the story for roughly three minutes, there's nothing overly significant about the newer cut. Taking a cue from video games and perhaps understandably realizing a good majority of its target audience would be teenage boys playing the Blu-ray on their equipped Playstations-- the Blu-ray offers one of the coolest video game/internet style pop-ups around throughout the disc as you're able to select watching the film in Black Ops Field Manual mode. Complete with a clock that begins running down the 96 hours Neeson has to find his daughter as well as a distance traveled meter and the number of individuals killed or injured-- it also manages to work in GPS Google Maps like images to show us exactly where a scene is taking place-- making the viewer feel as though they're on the Commando style mission with Neeson. Stunt junkies can get their fix on the Inside Action side-by-side segments (or actually a top and bottom screen) that shows the difference between what ends up cut together and polished in the movie and how it was all shot in reality, noting the changes in light and darkness as perhaps a filter was used to make the film appear grayer. Also included on the disc are the typically format-friendly features including premiere footage and two separate commentary tracks in two different languages as the filmmakers all speak French and the co-writer Robert Mark Kamen speaks English. However, while most making-of-the-film featurettes are largely ho-hum, Taken's was an exception as I was fascinated by the rapid pacing and decision making of Morel (who speaks in French throughout) as those involved discuss the challenges and style of the movie. It also offers some interesting pieces of information about the actors' process for example by informing viewers how Neeson manged to nail that initial phone call wherein his daughter (played by Lost's Maggie Grace) is taken as it's revealed that the actress flew out to film her side of the conversation unseen in a room next door, screaming for real so that his reaction was far more intense. Additionally, as a fan of cinematography, I also discovered some cool aspects about the film I'd missed the first time around. With former Luc Besson camera man Morel doing both his own photography as well as directing, he knew exactly what he wanted at all times. Speaking of his take on the look of the movie, he says that the camera translates the action from the start as it's illustrated in the scenes that occur in America the camera doesn't move since things are in balance in Neeson's life. However, once he arrives in Paris, our hero has declared war on the kidnappers and the camera's quick speed and movement helps heighten the tension considerably. Laughing that since Bourne Supremacy's excellent car chase, they knew they had their work cut out for them in trying to top it, Morel decided that in Taken, he would make the car chase scene even faster, double the danger by setting it at night, and ensure there were no crashes (well, onscreen at least). Also boasting a digital copy of the unrated extended version of the film you can quickly download onto your compatible portable decices (that works on both Apple and PC)-- while it's hard to imagine wanting to view the film in anything less than high definition, it's a wonderful bonus for fans who find themselves taken with Taken and want to bring it along with them. Visually dynamic throughout with extreme clarity running from left to right in each frame-- which is saying something since a majority of the picture takes place at night-- Fox's 2-Disc edition of Taken is further proof that they have this format down solid and are now beginning to expand on it even more by offering those cool bonus features like Black Ops (which also includes pop up facts about the situations and technical issues involved in the pursuit logistics-wise). A must-add to your Blu-ray library and a refreshingly smart, emotionally arresting action movie (and one of the standouts of '09)-- this Blu-ray is proof that every once in awhile it's okay to let yourself get Taken... by the film that is.